The removal of an eye can be scary, especially for a child. UI Health Care doctors and staff recognized an opportunity to change the experience and ease the concerns of young patients and their families. 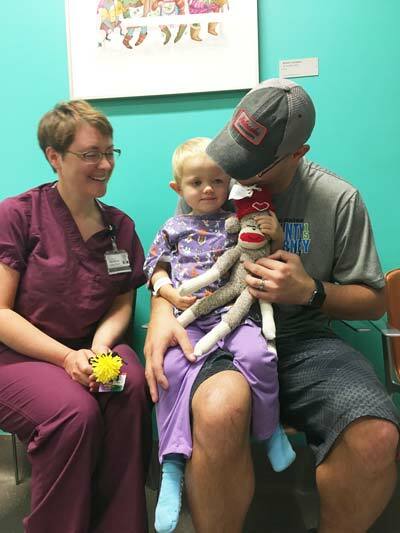 Team members from the Eye Clinic partnered with the UI Hospitals & Clinics Volunteer Services office to create a customized sock monkey doll for children who have an eye removed. The monkey features a winking eye to match the eye that the patient has removed (right or left). Hand-made monkeys also have different color remaining eyes and other features that add to the uniqueness of each. The idea for personalized monkeys came from UI student volunteer Kenten Kingsbury and oculoplastic surgeon Dr. Audrey Ko. 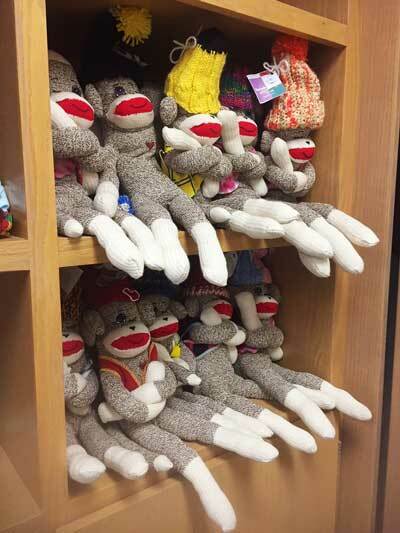 They realized that sock monkey dolls were being made by a hospital volunteer group known as the Merry Monkey Makers, so the two arranged through the Volunteer Services office to have monkeys specially designed for Eye Clinic patients. “The idea of removing an eye is very difficult. It brings up questions about a child’s appearance after surgery and concerns about how the process might affect a child for the rest of their life, both medically and socially. My clinic volunteer, Kenten, came up with the amazing idea after seeing a couple families go through the heartbreaking decision to remove their child’s eye due to retinoblastoma or trauma. We thought customizing the monkeys to match the needs of our unique patients seemed like a simple way to make the whole process of having a prosthetic eye a little less scary,” states Ko. 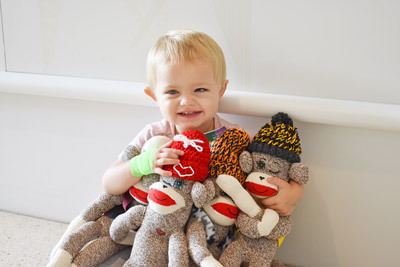 UI Health Care doctors and staff partnered with volunteers to create special sock monkeys to comfort young patients. 2-year old Ellie’s new friend (red hat) features a winking eye to match her eye removed due to eye cancer. A troop of customized monocular monkeys await their new owners and homes. Volunteer Kenten Kingsbury (left) and Audrey Ko, MD, show off a few of the customized sock monkeys created for patients. Lindsay Pronk BCO, BADO, with UI Hospitals & Clinics Ocular Prosthetics Service checks in with Ellie. Pronk created the artificial eye for Ellie and helps her parents on the proper care.